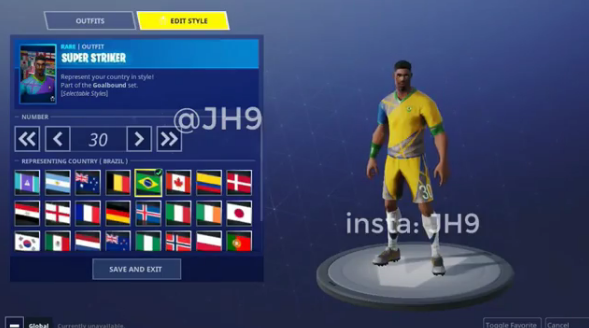 Yesterday's leak of soccer/football skins in Fortnite: Battle Royale were sure to excite fans of the world's game, but another new leak will take that excitement to a new level. 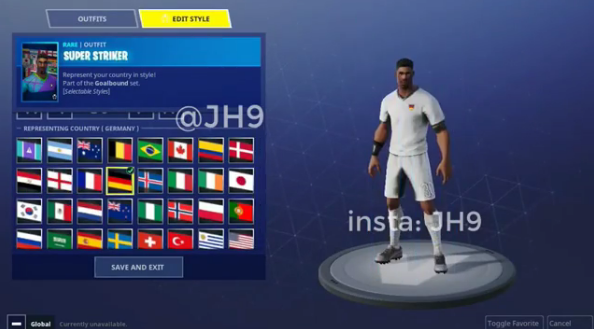 Not only will there be multiple skins featuring football kits, but they are customizable, according to this Instagram video by a known dataminer named JH9. Screenshots from the video can be seen below. One of the skins, Super Striker, is shown in the video. Uniforms are available for a number of countries, and changing them changes the look of the uniform entirely. Not only that, but you can even choose the number on the uniform, which is shown on the left pant leg and the back of the jersey. The 2018 FIFA World Cup begins this Thursday, June 14, A total of 32 countries will compete in Russia to try to win the title as the World Cup Champion while millions of Fortnite players run around and build in their favorite team's uniforms. From the video, it looks like there are at least 32 different styles to select. Another post by JH9 also includes a look at a new soccer-themed emote called "Kick Ups," which has the character juggling a soccer ball. Fortnite recently added basketball themed skins and an emote around the time of the NBA Finals. It's unclear when these leaked skins will come to the game, but some time this week or weekend is a safe bet considering the timing of them.